Last year I stole an idea from the fabulous Tara Whitney. 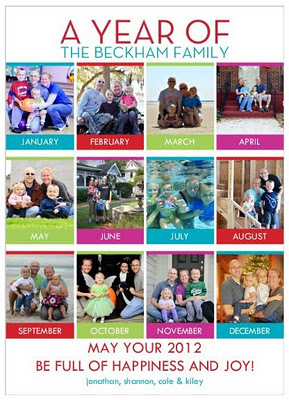 She had posted about taking a family picture every month for the entire year in 2010. I was completely inspired. So my resolution for 2011 was to follow in her footsteps and take a family picture of the 4 of us every single month for an entire year. I’m excited to share that I did accomplish my goal and I loved the pictures so much that I used them as our Christmas card for 2011. I also created a photobook in Shutterfly . I’ll be sharing that project tomorrow. For 2012 I have a new photo documentary project that I’m also going to be sharing in the next few days. I absolutely love this but I think my family would hate me for it. They already call me the photo nazi. Yours turned out beautiful!